Children grieve too…so what can you do? Elaine Clothworthy was just two years old when her father, Alastair, died of lung cancer in 1990. His passing left a big gap in her life which still remains. While Elaine doesn’t remember her father, she feels she knows him because her mother kept his memory alive during her childhood. Elaine’s feelings of loss were magnified during big moments in her life, such as school plays and graduations. Having worked as a primary teacher, Elaine now lectures aspiring teachers at Marino Institute of Education. She recently attended a course run by the Irish Childhood Bereavement Network (ICBN) on how grieving children should be supported. This will be part of teacher training at Marino going forward. Elaine feels she would have found her loss easier had such external supports existed when she was a child. Congratulations to all the lucky winners and a huge thanks to all our wonderful supporters who got involved selling Raffle tickets on our behalf and to all those who very generously bought them. Your support will help us fund our Nurses for Night Care Service. Thank you! The archive was launched in tandem with our impact report ‘Our Impact 1986-2016’ outlining 30 years of achievements. HUNDREDS of previously unpublished documents including letters from Mother Teresa about a hospice for AIDS patients are included in an online archive documenting 30 years of the Irish Hospice Foundation (IHF), . People can access the free online resource and browse through collections which feature some of the best known names from the world of music, poetry, literature, broadcasting and politics who have supported the IHF over three decades. There are 2,000 items in the online archive created to mark the 30th anniversary of the IHF. Mary Kennedy launched the archive in the Royal Irish Academy, saying: “This archive spans three decades of the IHF since it’s foundation in 1986 and features some very familiar names that have supported the hospice movement. It maps the history of the hospice including ground breaking IHF programmes like Hospice Friendly Hospitals and Nurses for Night Care, innovative fundraising projects like the Whoseday Book and their pioneering research. The free online resource contains over 75 Collections, 1070 images, 223 text files, 66 videos and 20 audio recordings at present. A unique design agency sketch giving layout of the Peter and the Wolf book which was illustrated by Bono in aid of the IHF. Laura Rooney Ferris, IHF Information and Library Manager and archive creator said: “Often after a death, the first thing we do is open family albums or boxes in the attic to bring back memories of a lost loved one. At the IHF we’ve spent three decades supporting people at end of life so the occasion of our 30th anniversary was a time to pause and gather on our own memories. Denis Doherty, IHF’s longest serving board member said: “A look back at the RTE documentary ‘Today Tonight – A Hospice for the Dying’ in the archive shows the remarkable vision Dr Mary Redmond had in setting up the IHF. The programme, aired 30 years ago, shows death for ‘many people’ in Ireland at that time ended in severe pain and isolation. Few doctors and nurses were trained to care for the special needs of the dying, the bereaved and those in pain. There were only three named hospices; one in Cork, Dublin and Limerick. The idea of dying without pain seemed a curiosity – an alien concept. The archive was launched in tandem with the IHF’s impact report ‘Our Impact 1986-2016’ outlining 30 years of achievements. 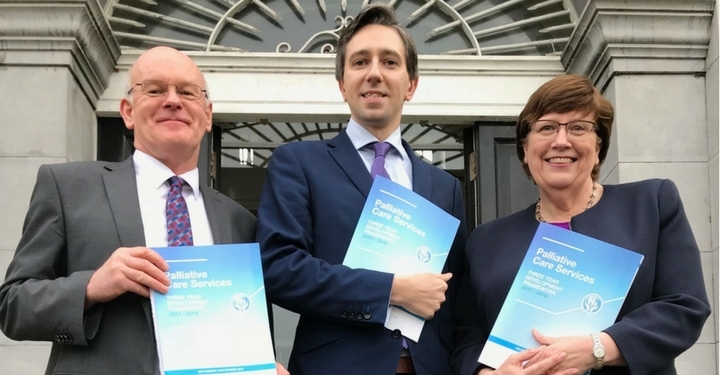 More than 150 hospitals and nursing homes have signed up to IHF programmes to improve end-of-life care. About three thousand healthcare professionals take part in IHF education and training programmes every year. The IHF’s Nurses for Night Care Service is helping 500 families annually, giving people the option to be cared for in their own homes during their final days. It has invested €4.5 million in palliative care services for children since 2005. The Death Café Conversation was organised by The Irish Hospice Foundation as part of their ‘Have Your Say’ national campaign and all feedback from the café will inform the first ever ‘Irish Charter on Dying, Death & Bereavement 2016’. Sharon Foley, CEO of The Irish Hospice Foundation was in Mullingar to meet with people and talk about the importance of this campaign. “The café conversation revealed amazing insights into what is priority at end of life and Mullingar surely had their say. Huge thanks to the warm crowd for giving such personal and valuable insights. It really sparked conversations about end of life such as who will mind the dog when I’m gone, can I donate my body, we need a Last Aid Course to equip us to deal with dying, death and bereavement and it’s easier to talk to about other people’s death rather than your own. There was a also resonating call for more bereavement services in Mullingar and it was clear that people want to talk openly about death to normalise this life happening. “People also completed the Have your Say survey on the day and all feedback will inform our ‘Irish Charter on Dying, Death & Bereavement 2016’ published next year. Anyone can complete the survey online https://www.surveymonkey.com/r/haveyoursayirl and follow the social media movement #haveyoursayirl,” continued CEO Sharon. Every day 80 people die in Ireland; that’s 29,000 people every year. Each of us will only get once chance to die, so it’s important to think about what matters to you. We believe best care at end of life is about supporting everyone to live well to the end with dignity and comfort, surrounded by loved ones. “We want you to #haveyoursayirl based on your experiences, knowledge, hopes and fears. We can then be informed on how to further ensure the best supports are in place for you and your loved ones. We are pleased to be leading such an important public discussion and creating this essential charter for the Irish people,” concluded Sharon. The Irish Hospice Foundation is partnered with Limerick Compassionate Communities (part of Milford Hospice) in the project; and working with the support of Dublin City, Fingal and South County Dublin County Councils.